In less than two weeks we're going to head to the polls and elect the 42nd Government of Canada. The elections process we use is pretty old and potentially outdated, and it's time that we started to take a proper look at how it works. A quick overview of what we currently have: on October 19th, you and the ~100,000 people who live closest to you will have the chance to pick who represents you at the House of Commons. Whoever gets the most votes between you and your neighbors wins, and becomes a Member of Parliament. Now, most candidates in each riding are associated with a political party. When they all get to the House of Commons, they tend to stick together with other people of their party, and most of the time vote the same way. Once everyone has gotten to the House of Commons, the Governor General (representing our Head of State, the Queen of England), offers the leader of the largest elected party the opportunity to form a government, which is subsequently voted on by all members of the House. Unless you happen to live in a riding with the leader of a major party, you never actually directly vote for who is going to be prime minister or how powerful of a government that leader will have. If the largest party has more than half of the seats (a majority), they'll win this vote pretty easily and form government. If they don't, they can still form government by arranging deals with other parties, but probably won't stick around for too long. This is actually really badly distributed, and the problem is serious enough that there are often laws in place to prevent this sort of thing from happening. In Alberta, for instance, the Electoral Boundaries Commission Act limits population deviation between provincial electoral divisions to 25% of the average. Provinces like Saskatchewan and New Brunswick limit deviation from the average to only 5%, but in federal elections the largest deviation is an overwhelming 73% below average. So our system isn't really all that great at ensuring that everyone's vote is worth the same, but is it any good at reflecting people's voting choices? Not entirely. 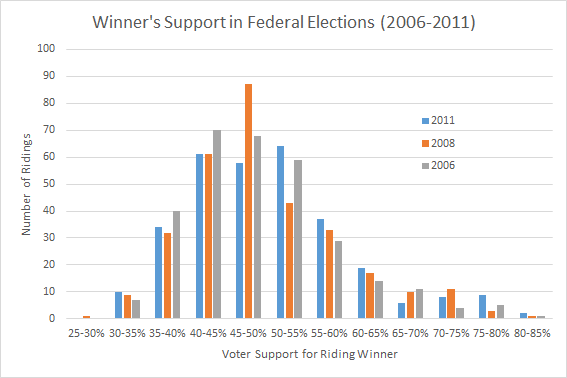 At a small scale, the winner of any given riding is indeed the candidate with the most total votes, but more often than not they don't win with a majority of votes. Over the last three years, 58% of seats have been won with less than 50% support, and the worst winner became an elected Member of Parliament with only 29.1% support. This in and of itself isn't inherently evil, but our system is designed to elect representatives for each riding, and it is hard to argue that someone with less than 50% support is always the most representative of the area. The worst case situation I mentioned earlier had a Bloc Quebecois member elected with 29% support, but if the elected MP were to vote on the issue of Quebec separation, should he listen to the 29% of people who supported him, or the 71% of people who voted for explicitly non-separatist candidates?? Most issues that MPs vote on aren't that white-or-black, of course, but it's not unreasonable for MPs to be put in positions where their party line disagrees with the majority opinion of their constituents, and this is not an effective form of representational democracy. This leads to one of the biggest issues with First Past the Post electoral systems - they are prone to dishonest or strategic voting. In our current election, there is a push from multiple groups to coordinate voting in swing ridings, with the mindset that it's better to vote against a specific party than to vote for a party you actually care about. Any seat that is won with less than 50% support can be prone to strategic voting, especially if voters either don't feel their preferred candidate has a chance to win or if voters are particularly angry at the front-runner. 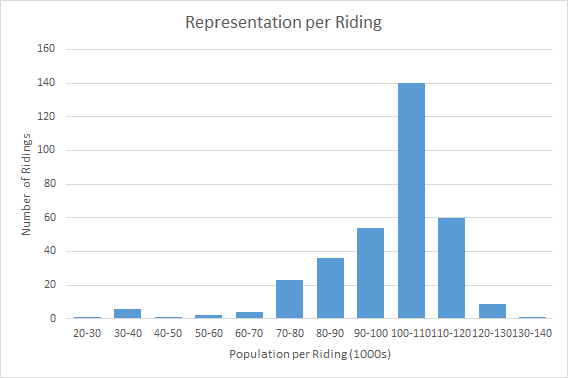 When we zoom out a bit, though, this lack of majority support per riding can lead to larger effects on a reigonal scale. If a region of five ridings has an evenly-distributed population with, say, 40% support to one party and 30% support split between each of two other parties, the party with 40% could easily end up with candidates elected in a majority of ridings and take control easily (if that party has control of setting electoral boundaries, they can potentially do this even without being the most popular by gerrymandering). For the last four elections, the parties that contested all available seats (hence the lack of Bloc Quebecois in the graph, they're silly anyway) have actually very neatly traced a cubic relationship between party support and seat allocation, instead of the line that we might expect. Before I talk about proportional representation too much more, I'd like to acknowledge a key assumption about proportional representation: it is often assumed that a voter for a candidate from a party in one region supports that party in all regions. This is definitely not always the case - I personally have voted for candidates while disliking their party leadership, and have known others to vote strictly based on candidate and not on party at all. When people argue that a party with 40% voter support should get 40% of the power in the House of Commons, that is definitely not the motivation that has driven all of those votes to have been cast in the first place. Nevertheless, there are certainly benefits to having a system where party power post-election reflects party support. Much like an individual MP being elected with less than half of the support of their riding, the above graph shows that it's likely (and has certainly happened in the past) for parties to end up with a majority government with less than a majority of voters' support. Hopefully by now I've shown that there are issues with the current first past the post system that we have in Canada. Not everyone's votes counts at the same value, and once they've been counted we're not represented to the best extent possible. There are three leading proposals out there that are being put forward for how to deal with some of the shortfalls of our current system that are worth discussing: Alternative Voting (AV), Mixed Member Proportional (MMP), and Single Transferable Vote (STV). There are, of course, hundreds of ways that we could change our system, but these three have a history of being considered in Canada, and are worth taking a closer look into. AV (also called Instant-Runoff Vote) isn't officially being proposed by a political party right now, but is apparently a leading possibility in the Liberals' current plans to overhaul the electoral system. When voting in an AV election, every voter has the choice to rank as many candidates as they want. All voters' first choices are added up, and if any candidate has over 50% of the votes they win. If nobody has enough, then the candidate with the lowest first-place votes is eliminated, and all votes for them are redistributed to the second-ranked choices. This process continues until eventually one candidate has over 50% of the vote and wins. If we were to replace our current system with Alternative Vote tomorrow, the results in ~42% of our ridings would definitely not change at all, as historically about that many seats have over 50% support to one candidate anyway. Only ridings with very close first-round results would be likely to end up differently between FPTP and AV election systems - quite often the front-runner off the first-choice votes ends up winning. So why is Alternative Vote any better than First Past the Post? Mainly because it reduces the need of strategic voting. If your favored candidate is unlikely to win, you don't have to consider a vote for them wasted, because either the winner will win with over 50% support (and you couldn't have changed it anyway), or your vote will get redistributed to someone else of your choice. This is good inasmuch as it allows voters to vote with their conscience. On the other hand, all the rest of the problems that exist in First Past the Post still exist in Alternative Vote. An analysis of the 2015 UK election, for instance, suggests that the results would have been even more disproportionate under AV than FPTP, and while it's true that voters can't be left with a candidate winning with 30% support, if the 50% benchmark is hit through a series of second, third, or fourth-place votes then we still have a situation where the majority of voters never picked their representative, or only picked them as a compromise solution. 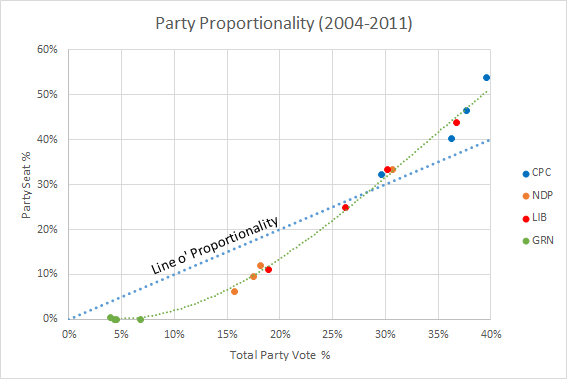 Keeping a system of single-winner ridings with a minimum 50% support doesn't ensure proportionality at all. MMP has been proposed by the NDP as an election promise this year, to be implemented by the next election. It has been proposed by the Law Commission of Canada and independent provincial commissions, but has also officially been rejected by the voters of Ontario in 2007. Youtube again does a very good job of explaining it here, but the quick explanation is that when a voter goes to vote in an MMP system, they get two ballots. One is the exact same as our current ballot, and the other is strictly for party preference. After all votes are cast, whoever ends up with the most votes in each riding from the first ballot gets elected, just as normal. After that, the proportion of party support received off the second ballot is compared to the number of seats won from the first ballot, and additional seats are filled from pre-existing party lists until the overall proportion of seats in the House of Commons matches the proportion from that second ballot. Overall, half of the seats in the House of Commons would be filled by each ballot. MMP is touted as providing a good balance between keeping geographical representation, while guaranteeing partisan proportionality and avoiding the need for strategic voting. However, it misses the mark on most of these. So let's focus on the second half of the ballot. By filling seats based on a candidate's ranking on a party list, instead of electing them directly, a whole second class of MP would be created. These MPs wouldn't be accountable to any citizens or have to represent them, since they would owe the existence of their jobs solely to the popularity of their party. In my opinion, this is less of an issue in countries that currently use MMP, like New Zealand, Germany, and Scotland, than it is in Canada, mostly because combined those three countries cover an area only a little bigger than Alberta. If a party ends up being elected largely without direct constituency seats, then their MPs in the country capital may not be the best suited to debate issues taking place thousands of kilometers away as opposed to only hundreds of kilometers away. The lessened importance of geographical representation in MMP becomes more of an issue when your country sprawls across five and a half timezones. The second ballot of MMP also isn't immune from strategic voting. For instance, in the 2005 Albanian election the two major parties convinced their supporters to vote for them on the constituency ballots, and to vote for smaller coalition partner parties on the party ballot. This resulted in an unbalanced situation where previously tiny parties shared all the party ballot seats, and the large parties shared the constituency seats, and a pre-determined coalition took control. Similarly, in the 2007 Lesotho election, the major parties split in two and used decoy parties for the list seat votes. This example of gaming the system resulted in one party taking 69% of the seats with 52% of the vote. Obviously these are in the past and the development of a new electoral system could hopefully take steps to avoid loopholes like this, but other concerns still exist. MMP ballots tend to fall into two camps - open lists or closed lists. A closed list would trust the parties to fill in their top-up seats at their discretion, creating the possibility of career politicians who keep getting elected based on value and loyalty to the party, whereas an open list (as favoured by the NDP) would have voters choose the list of MPs-to-be. Needless to say, this option would take a "simple two ballot" system and add an enormous amount of ranking to it. Mixed Member Proportional voting system tries to be the best of both worlds, but doesn't necessarily excel at either. Its local representation has all the issues we already have, and its push for proportionality creates a second class of MP with questionable accountability. Both MMP and AV appear to be half solutions to the current issues with FPTP, but they seem to address separate halves of the issue. STV was recommended by the Citizens' Assembly of British Columbia in 2004, and got 57.7% percent support in a 2005 referendum. But the BC government said they wouldn't be bound by anything lower than 60% support, campaigned hard against it, and when it came back to referendum in 2009 it only got 39.1% support. Yet again, Youtube has a good explanation, but what happens in STV is that ridings are merged together, with several winners getting elected from each riding. Because of this, each party can nominate multiple candidates. Voters then rank as many candidates as they want in each riding. Based on the number of seats to be filled in each new riding, a minimum threshold of votes is needed to get elected. Then an adapted version of Alternative Vote takes place - any candidates with more than that the threshold are elected, and their surplus votes are redistributed at a fractional value to the next-ranked choices. This repeats until no candidate has reached the threshold, at which point the lowest-ranked candidate is eliminated, and voters' subsequent choices are redistributed at full value. The use of fractional vote redistribution for winners ensures that voters who pick popular candidates aren't penalized. If a majority of the population all pick candidates from Party A, then effectively the most popular candidate from the party will share their surplus votes to voters' subsequent choices, so that voters don't have to worry too badly about the order in which they rank multiple more-or-less equal choices. Similarly, candidates who are eliminated have their votes redistributed at full value so that their voters aren't penalized either. So how does this fix anything? Well first of all, the issue in FPTP where people could feel unrepresented is very nearly eliminated. Imagine a riding that elects five MPs - in this case, each MP would need 16.67% of the vote (plus one vote) to get elected. This is the minimum threshold that five MPs could each hold, but that six people couldn't (because of the +1 vote requirement). This means that, at the absolute worst case scenario, 83% of everyone's ballots would go directly or indirectly towards electing someone, and almost always the people elected would be the first or second choices of the voters. Strategic voting would no longer be an issue. Unlike FPTP, if a voter's preferred candidate doesn't get elected, that isn't going to jeopardize the chances of a compromise candidate. Voters could vote with a clear conscience, and smaller parties would not have to worry about losing votes to strategic coordination. Also, the more seats there are in each riding, the closer to proportional the overall result would become. If 40% of people vote Party A in a 5-person riding, then only the two most popular Party A candidates will get elected, and all the votes cast for Party A candidates won't be redistributed anymore because they've succeeded in getting seats filled. Smaller parties will have a better chance of getting elected by the popularity of individual candidates, as the threshold to get elected to a multi-seat riding will be lower. While the national results will be very close to proportional, proportionality isn't the end-goal of STV like it is in MMP. That means that voters who vote based on party affiliation can lump their ranking by party, but voters who vote based on candidates would be free to do so as they wish. STV keeps geographical representation and proportional representation. So why isn't it being proposed by any major parties? Well for starters, those reports I mentioned before supporting MMP were a bit weakly worded. The PEI report liked both systems, but felt that MMP would be easier to swallow for Canadians since it's only changing half of the system (pg 98). The Law Commission report considered STV for about half a page (pg 103) before rejecting it based on it not having "geographical representation ... effective/accountable government ... [or] regional balance" without explanation. To their credit, neither the Liberals nor the Green Party have dismissed STV, and instead officially are proposing to form committees to investigate the best way forward. Most complaints about the STV system are that it is complicated to explain and results in long ballots. These are definitely true, though as mentioned before an open list MMP system would likely have a similarly long ballot, and the idea of ranking people is the same as in AV. STV is also certainly not the most complicated voting system out there, but often the complications are required to avoid strategic voting openings. Canada's electoral system is old and showing some signs of wear and tear. Both the disproportionate and inadequate representation that we have in our current system can and should be fixed, and the sooner that this happens, the better. But we don't have to accept only the Alternative Vote being entertained by the Liberals or the Mixed Member Proportional system offered by the NDP - they are at best half a fix, and at worst no better than our current system. If we're going to fix this, we should do this right. Mike, it would be great to see a followup post that incorporated data from the 2015 federal election. Did the number of ridings where members were elected by more that 50% of voters increase? 62.1% of seats were elected with under 50% of the vote (210 of 338 seats).